Howdy ho everybody! Lately I’ve been hearing people talk about In Ear Monitors (IEM’s) and how complicated they can be. Well, I’m hear to give you my input and solution. I love IEM’s, they give not only the artist a clear representation of what they are hearing, but save you back from carrying all those wedges. I see a lot of bands now in clubs or where ever carry a monitor desk with made up mixes so all they have to do is plug in and go. On the flip side, I love wedges because then the artist is in an environment and not relying off the crowd mics that the engineers need to put out so they aren’t playing to themselves. The downside? Feedback. That’s a big downside. Also, that’s why I give the advantage to IEM’s. ANYWAY, a good in ear system you ask? Sennheiser‘s ew 300 IEM G3. It will cost a hefty penny ($1,000 worth of pennies), but it’s very worth it. With it’s sturdy metal casing, it has a cool auto lock feature that prevents any accidental setting changes. Another biggie is that there is an ethernet port so the wireless systems manager can monitor each wireless unit by computer. 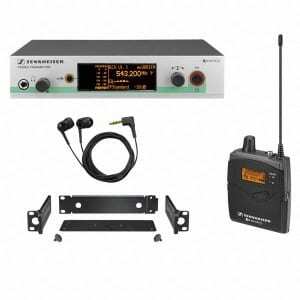 Along with a mute button on the transmitter AND multiple frequencies to chose from, this is a great system that will help you not bother your monitor engineer as much.